EVgo is the nation's largest public DC Fast charging operator, currently offering nearly 670 DC Fast charging stations across the U.S.
NASHVILLE, Tenn. and WOODCLIFF LAKE, N.J. – Nissan and BMW, two of the top EV manufacturers, have again joined forces – this time with EVgo, the nation's largest public DC Fast charging network – to increase public access to DC Fast charging stations across the U.S., with an additional 174 locations in 33 states now available to all EV owners in those markets, and over 50 more planned to be installed in 2017, supported by the partnership. The breadth of EVgo's expansive fast charging network now totals 668 dual-port DC Fast charging stations installed and available to all EV drivers across the United States, with access to new chargers continually growing. This expansion, designed to support Nissan LEAF and BMW i3 customers and to promote increased adoption of electric vehicles (EVs) nationwide, builds on the 120 dual-port DC Fast chargers that Nissan and BMW announced together in December 2015. "BMW's continuing collaborations with Nissan and EVgo, further demonstrate the company's commitment to building a robust public charging infrastructure across the country. We are on the forefront of an industry-wide commitment to support the expansion of convenient and accessible electric vehicle charging options," said Robert Healey, head of EV Infrastructure for BMW of North America. "The expansion of the plug-in vehicle charging infrastructure will give more U.S. drivers the confidence to choose an electric vehicle, such as the BMW i3, as longer distance EV travel becomes increasingly commonplace." "Nissan continues as a leader in building accessible infrastructure to benefit Nissan LEAF drivers as well as all EV owners. Infrastructure for all is a key strategic priority for us as we continue expanding the network of dual-port quick chargers across the country," said JeSean Hopkins, senior manager, Nissan EV Infrastructure Strategy & Business Development. "We look forward to ongoing teamwork and the continued build-out of public quick-charge stations." "EVgo is delighted to expand our partnership with BMW and Nissan, and to be able to bring more loyal i3 and LEAF owners around the country access to our convenient, premium DC Fast charging services. We are constantly looking at strategic ways to expand our network and promote EV adoption to help make every day EV use a reality for our OEM partners and their vehicle owners," said Rob Barrosa, vice president, OEM Strategy and Business Development at EVgo. Each location offers a dual 50 kW DC Fast charging station with both CHAdeMO and SAE Combo (CCS) connectors, serving owners of both Nissan LEAF and BMW i3 electric cars, as well as all EV drivers in the U.S. whose vehicles - regardless of brand - are equipped with quick-charge ports. These 50 kW stations can charge EVs from Nissan and BMW up to 80 percent in about 25-30 minutes, as compared to the longer time required to recharge at a Level 2 (240V) charger, currently the most commonly available public charging station. Since the launch of Nissan LEAF – the world's best-selling electric car – Nissan has reinforced its commitment to zero-emission mobility with investments in EV charging infrastructure to serve the needs of LEAF drivers in markets across the U.S. Nissan also recently introduced the new 2017 LEAF, which comes with an EPA range of 107 miles, making it the first affordable EV to get more than 100 miles on a single charge. Nissan LEAF gets 126 MPGe city and 101 MPGe highway on S models, and 124 MPGe city and 101 MPGe highway on SV and SL trim levels. All LEAF models feature an 80kW AC synchronous motor that generates 107 horsepower and 187 lb-ft of torque, providing a highly responsive, fun-to-drive experience. BMW i is focused on the development of visionary vehicles and mobility services, inspiring design, and a new understanding of premium that is strongly defined by sustainability. The BMW i3, the first all-electric production vehicle from the BMW Group, has won numerous awards around the world and has been the standout in the electric vehicle field since its launch in 2013. Among the many awards, in 2014 the BMW i3 was selected as both World Green Car and World Car Design of the Year. In 2015, the BMW i3 was named Green Car Journal Green Car of the Year as well as Yahoo Autos Green Car. The BMW i3 electric motor was also named to that year's list of Ward's Auto's 10 Best Engines. With a 170 horsepower electric motor, the 2017 BMW i3 is available with a 33-kWh lithium-ion battery, and can travel emissions free for up to 114 miles on a charge. The 360° Electric program, offering products and services to support new BMW EV and plug-in vehicle owners, and extensive investments in public infrastructure underscore BMW's continued commitment to sustainable mobility. In North America, Nissan's operations include automotive styling, engineering, consumer and corporate financing, sales and marketing, distribution and manufacturing. Nissan is dedicated to improving the environment under the Nissan Green Program and has been recognized annually by the U.S Environmental Protection Agency as an ENERGY STAR® Partner of the Year since 2010. More information on Nissan in North America and the complete line of Nissan and Infiniti vehicles can be found online at NissanUSA.com and InfinitiUSA.com, or visit the U.S. media sites NissanNews.com and InfinitiNews.com. Nissan Motor Co., Ltd., Japan's second-largest automotive company, is headquartered in Yokohama, Japan, and is part of the Renault-Nissan Alliance. Operating with more than 247,500 employees globally, Nissan sold 5.32 million vehicles and generated revenue of 11.38 trillion yen (USD 103.6 billion) in fiscal year 2014. Nissan delivers a comprehensive range of more than 60 models under the Nissan, Infiniti and Datsun brands. Nissan leads the world in zero-emission mobility, dominated by sales of the LEAF, the first mass-market, pure-electric vehicle. It is the best-selling EV in history. For more information on our products, services and commitment to sustainable mobility, visit our website at Nissan-Global.com/EN/. BMW of North America, LLC has been present in the United States since 1975. Rolls-Royce Motor Cars NA, LLC began distributing vehicles in 2003. The BMW Group in the United States has grown to include marketing, sales, and financial service organizations for the BMW brand of motor vehicles, including motorcycles, the MINI brand, and Rolls-Royce Motor Cars; Designworks, a strategic design consultancy based in California; a technology office in Silicon Valley and various other operations throughout the country. BMW Manufacturing Co., LLC in South Carolina is part of BMW Group's global manufacturing network and is the exclusive manufacturing plant for all X5 and X3 Sports Activity Vehicles and X6 and X4 Sports Activity Coupes. The BMW Group sales organization is represented in the U.S. through networks of 341 BMW passenger car and BMW Sports Activity Vehicle centers, 153 BMW motorcycle retailers, 126 MINI passenger car dealers, and 36 Rolls-Royce Motor Car dealers. BMW (US) Holding Corp., the BMW Group's sales headquarters for North America, is located in Woodcliff Lake, New Jersey. EVgo leads America's electric vehicle revolution. Our mission: Build the nation's largest EV charging network while improving the planet and boosting the economy. We put the right chargers in the right places. Together we unite the EV movement for all, making it unstoppable. EVgo provides access to hundreds of public charging sites across the United States. To find out more, or to join the EVgo network, visit www.evgo.com. Connect with EVgo on Facebook and follow us on Twitter. 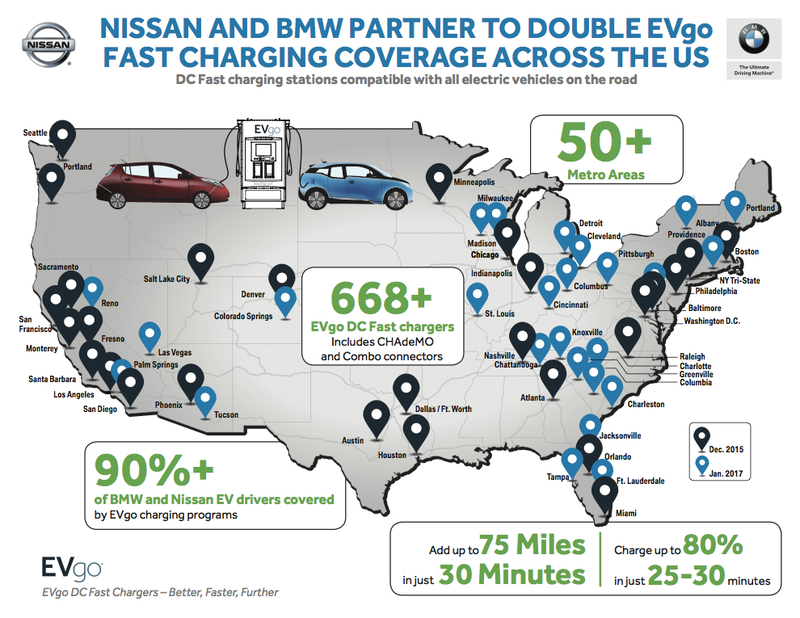 (1) States and markets in which BMW and Nissan have installed dual-port DC Fast chargers on the EVgo network include: Arkansas, Arizona, California, Colorado, Connecticut, Washington D.C., Florida, Georgia, Illinois, Indiana, Kentucky, Massachusetts, Maryland, Maine, Michigan, Missouri, Nevada, New Hampshire, New Jersey, New York, North Carolina, Ohio, Oregon, Pennsylvania, Rhode Island, South Carolina, Tennessee, Texas, Utah, Vermont, Virginia, Washington and Wisconsin.